Toby was built by James Holden at GER's Stratford Works in 1903 and originally lived at Great Yarmouth Docks, Norfolk with his brothers before working on an unnamed tramway. In 1951, Toby came to work at the quarry on Thomas' Branch Line after his old railway in East Anglia closed, as it was found to be illegal for Thomas to go on the quarry tramroad without sideplates or cowcatchers. 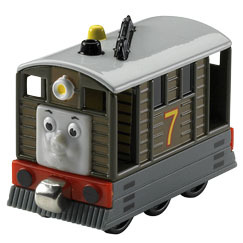 Toby is old and, at first, was teased by James for his shabby paint. James stopped calling him names after he crashed into some tar wagons and Toby was given chocolate-brown paint for his hard work. Toby has two coaches named Henrietta and Victoria and a luggage van called Elsie.